Its fall. Yep, there is no denying it. Well, in London anyway. The leaves are on the ground, the air has a crispness to it and everyone has a cold. Yep, summer is over. The good thing is: new season, new vegetables! 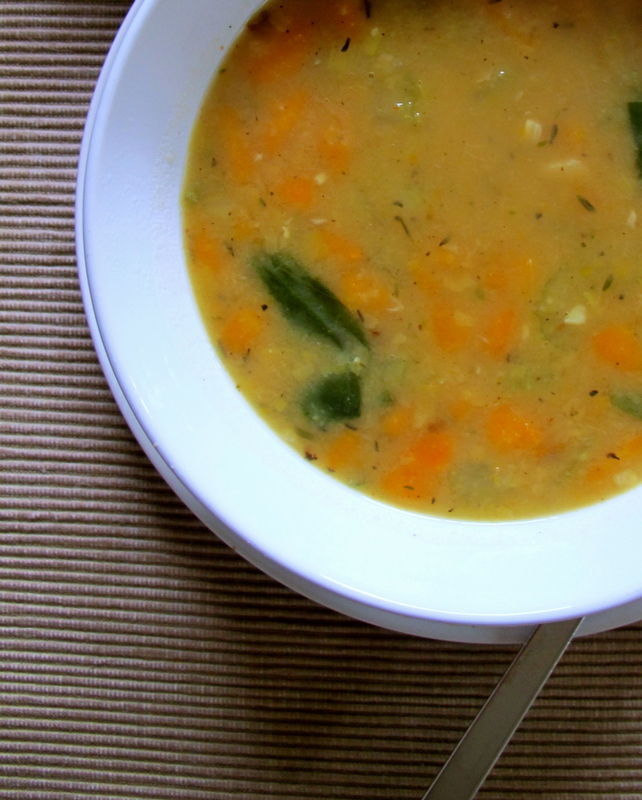 Time for some hearty, warming, stick to your bones meals. 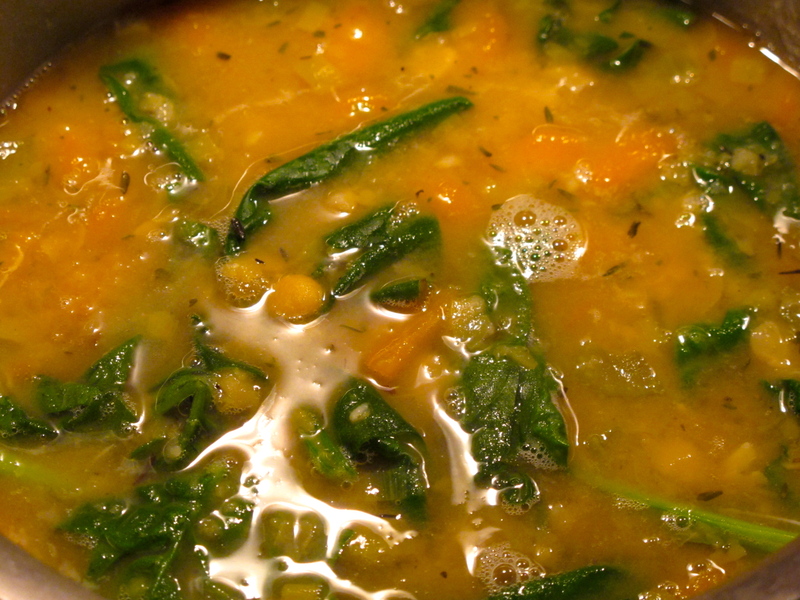 One of my favorite dishes for fall is Split Pea soup. Growing up, like most people, it was made with a big ol’ham hock. I always thought that was what gave the soup its delicious flavor. Nope. It’s actually the split peas. Those little dried peas are absolutely bursting with flavor all by themselves. It’s quite shocking actually. They have this great smokey, deep, hearty flavor. So there is no need to add any meat to this dish. The split peas are certainly the star of this show. 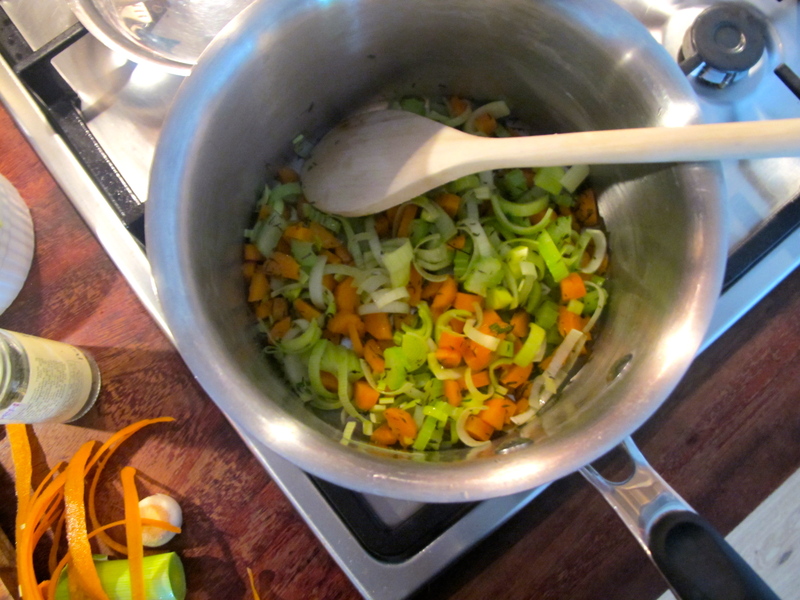 Chop the leek, carrots and celery into 1/2 inch pieces. Chop the garlic and herbs. In a medium-sized pan over medium heat, add a dash of olive oil and once hot add in the veggies. Cook for 5 mins. Add in the garlic and herbs. Cook for 1 min. Add in the split peas and 2.5 cups of vegetable stock. Reduce to a simmer and cook for about 20 mins. Check the soup after 20 mins, if it is too thick add some water, if it is too thin you can add in a diced potato. At this point add in the chopped spinach. Add a dash of balsamic vinegar and s&p. Options: If you want the soup hearty, then you can serve as is otherwise you can blend it to a creamy consistency. Can we say “Fiber”!? 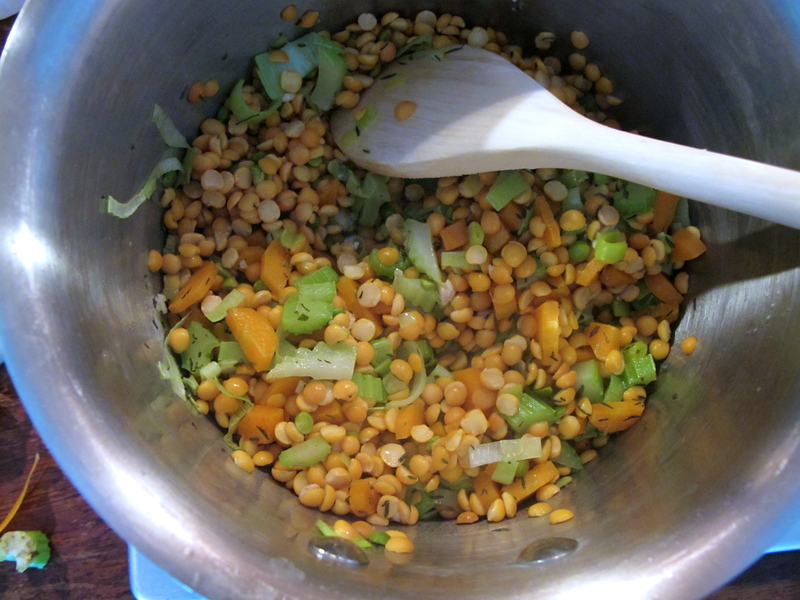 Just 1 cup of split peas equals more than half of your daily required intake of fiber. Wow. “Dried peas, a small but nutritionally mighty member of the legume family, are a very good source of cholesterol-lowering fiber. Not only can dried peas help lower cholesterol, they are also of special benefit in managing blood-sugar disorders since their high fiber content prevents blood sugar levels from rising rapidly after a meal. Fiber is far from all that dried peas have to offer. Dried peas also provide good to excellent amounts of four important minerals, two B-vitamins, and protein–all with virtually no fat. As if this weren’t enough, dried peas also feature isoflavones (notably daidzein). Isoflavones are phytonutrients that can act like weak estrogens in the body and whose dietary consumption has been linked to a reduced risk of certain health conditions, including breast and prostate cancer. Check a chart of the fiber content in foods and you’ll see legumes leading the pack. Dried peas, like other legumes, are rich in soluble fiber. Soluble fiber forms a gel-like substance in the digestive tract that binds bile (which contains cholesterol) and carries it out of the body. Research studies have shown that insoluble fiber not only helps to increase stool bulk and prevent constipation, but also helps prevent digestive disorders like irritable bowel syndrome and diverticulosis. A single cup of cooked dried peas provides 65.1% of the daily value for fiber. In addition to its beneficial effects on the digestive system and the heart, soluble fiber helps stabilize blood sugar levels. If you have insulin resistance, hypoglycemia or diabetes, legumes like dried peas can really help you balance blood sugar levels while providing steady, slow-burning energy. Studies of high fiber diets and blood sugar levels have shown the dramatic benefits provided by these high fiber foods. Researchers compared two groups of people with type 2 diabetes who were fed different amounts of high fiber foods. One group ate the standard American Diabetic diet, which contains 24 grams of fiber/day, while the other group ate a diet containing 50 grams of fiber/day. Those who ate the diet higher in fiber had lower levels of both plasma glucose (blood sugar) and insulin (the hormone that helps blood sugar get into cells). The high fiber group also reduced their total cholesterol by nearly 7%, their triglyceride levels by 10.2% and their VLDL (Very Low Density Lipoprotein–the most dangerous form of cholesterol) by 12.5%. In addition to their stellar fiber content, dried peas also feature other heart healthy nutrients. They are a good source of potassium, which may decrease the growth and development of blood vessel plaques and is also good for lowering high blood pressure. A cup of cooked peas will supply you with 20.3% of your daily need for potassium. 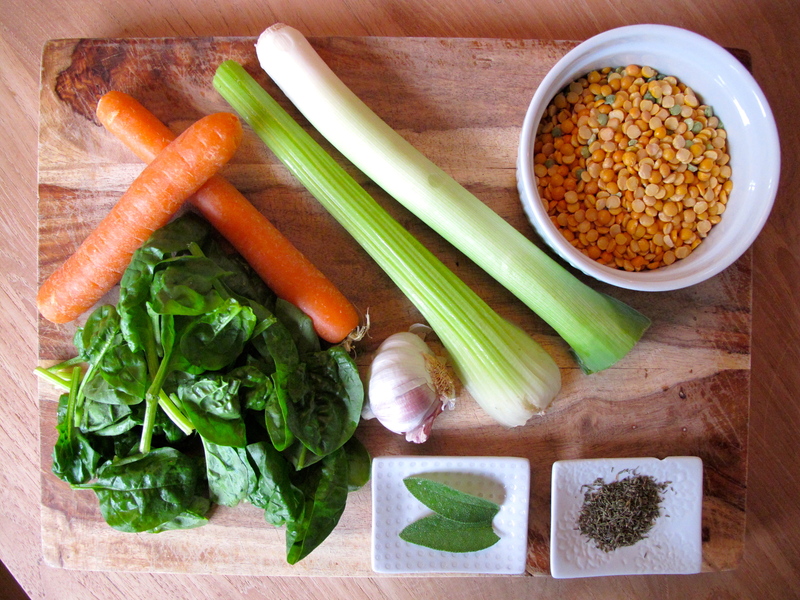 This entry was posted in RECIPES, SOUPS, VEGAN and tagged easy, fall, fiber, healthy, low fat, model diet, quick, soup, split peas, vegan on September 21, 2013 by Kelly O'Dell.